Steven Ceraso received his MFA in Sculpture from Claremont Graduate University and his BFA from Long Island University Post. His work is an ongoing exploration of discarded objects and reclaimed materials. His studio is in Bay Shore NY. Recent exhibitions and projects include 5th Avenue SAW Bay Ridge Brooklyn, Fountain Art Fair NYC, Williamsburg Art Walk Brooklyn NY, Franklin and Marshall College, Lancaster PA, Sculpture Walk, Columbus GA, The Farm Project, Garrison NY, and Brecknock Hall, Greenport NY. Long Island and is an instructor at Makeville Studio in Gowanus Brooklyn. 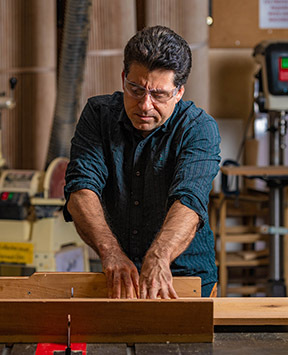 Steven has previously taught woodworking at 3rd Ward Brooklyn, and advanced sculpture at Long Island University Post.